Homeowners at a new Habitat for Humanity subdivision in East Anchorage have come a long way. This fall, Habitat for Humanity Anchorage drove the final nails and turned over the last sets of keys at its biggest endeavor yet: Neighbor Drive, a collection of 23 townhouse condos off Oklahoma Street in East Anchorage. "This is by far the biggest subdivision we've built," said Noah Sunflower, director of homeowner services. When the last family moves in early next month, it will bring the total of new-construction homes Habitat has built in Anchorage to 93. Founded here in 1992, to provide decent and affordable housing, Habitat has also rehabilitated 12 existing Anchorage homes. Executive director Elaine Phillipps said Neighbor Drive represents a success, of which the organization is deeply proud. Residents represent far-flung points across the globe, each with a compelling and unique story to tell. That diversity, while welcome, wasn't intentional, she said. It speaks to the motivated people who applied and have stuck with the process, whether they grew up in Anchorage, Africa or anywhere else. "They work really hard. They really, really do," Phillipps said. "They touch and motivate my heart when you sit and talk with them." Habitat makes homes available at the cost of construction to its selected applicants. To do that, it relies on a volunteer effort to build the homes and for in-kind donations. Currently, Habitat remains an investor in the property, owning the difference between the cost of construction and the market value of the home at the start of the loan's term. That difference transfers to the homeowner over the life of the loan, beginning in year six. To be considered, Phillipps said applicants must demonstrate need, prove good or repairable credit and an ability to pay the mortgage, and commit to partnering in the process. That includes 250-600 hours of "sweat equity" to build the home itself or on other Habitat projects, and attendance at several meetings and classes. Now that Neighbor Drive is complete, Habitat for Humanity Anchorage is working to rehabilitate four existing homes. Sunflower said the organization hopes to begin accepting applications in spring 2017 for its next new construction project. Details are still being finalized, Phillipps said. Alaska Dispatch News visited several Neighbor Drive households to meet the new owners. 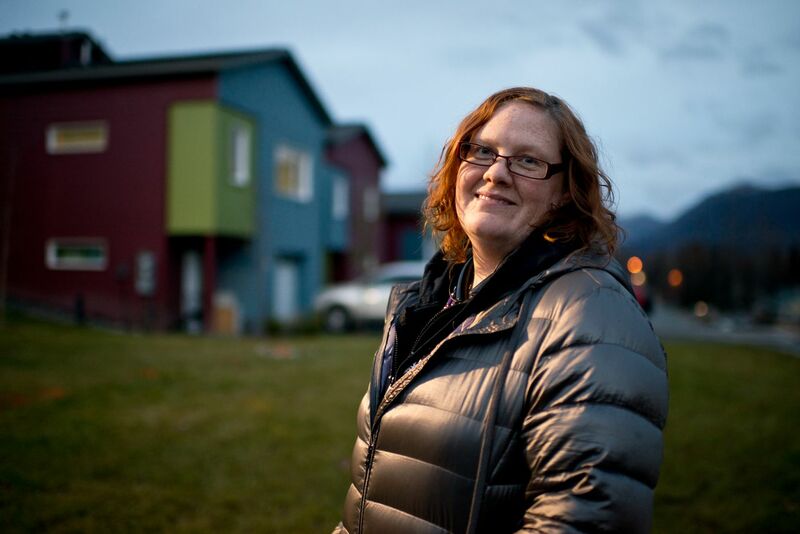 In interviews, they shared stories about the long and difficult roads they'd traveled toward homeownership on Anchorage's Eastside. Ernest Kalumba remembers the stress of 2008. His was one of many families that applied for resettlement in the United States from a refugee camp in Zambia, one he describes as horrible. Clean water was scarce and sanitation was poor, he said. No education was available to his kids, and no employment opportunities for adults. His family lived in a tent for 11 years. He certainly couldn't go back to Congo, his homeland. Civil war had driven him from there, and because he came from a military family, he and his loved ones were targets. "So when the rebels come in the country, (they were) looking (for) all the active military (and) military families, to kill everybody," he said. "So to exterminate everybody." Awaiting the envelope with a decision on his resettlement, he worried about whether he and his wife had properly impressed the interviewers. Had they given any conflicting statements? Had they done all they could to demonstrate their commitment? Around him, other families cried when they learned they weren't selected. In November of that year, after a flight that stopped in Kenya, Belgium and then New York City, Kalumba was offered placement in Alaska. The day he touched down, he saw snow for the first time. English lessons and odd jobs came next, first as a landscaper and then in a hotel's laundry room. Now, Kalumba is building a career in medical care, first as a personal care attendant and now as a certified nursing assistant. Kalumba feels at home in Anchorage now, and has come to enjoy the weather. On Neighbor Drive, where he lives with his wife and five of his six kids, it's quiet, peaceful and happy. 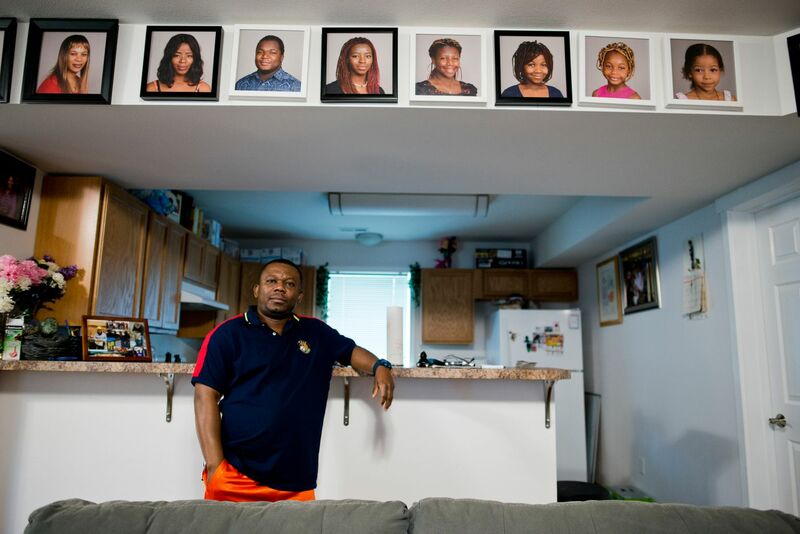 Inside his home, family pictures bordered the living room where he sat on a fall afternoon. His plan is to live the rest of his life in Alaska. "We are safe in this place," he said. Raghu Mishra left "bamboo life" in 2009. That's how he refers to his 18 years in a refugee camp for Bhutanese people in Nepal. "Everything made of bamboo," he said. "We used to eat bamboo. We used to sleep bamboo. When we died, they used to burn our bodies with bamboo." He feels his stress level rise when he thinks about that time, he said. People died of preventable diseases and snakebites. Food rations were often insufficient. Mishra remembers when his father slept, he and his siblings would borrow his shoes because they didn't have their own. Education opportunities were good, but employment was hard to find for refugees, and usually involved under-the-table hard labor. 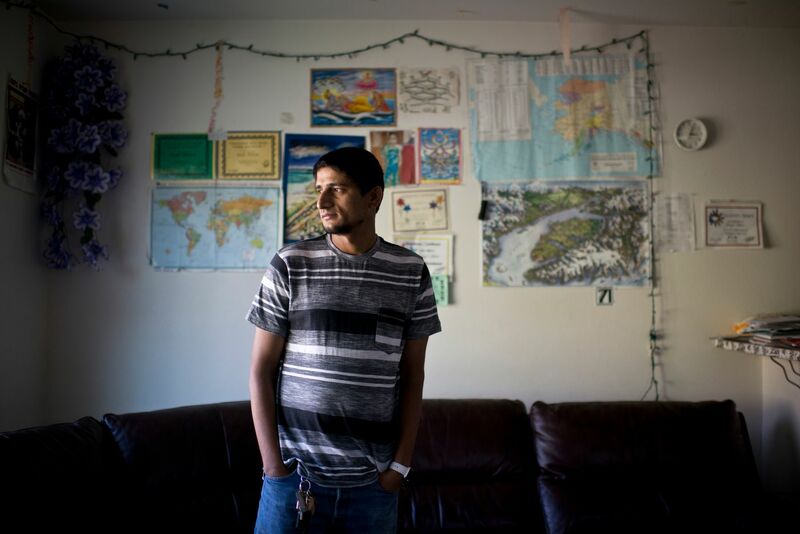 When Mishra first came to Alaska, he had $17 in his pocket. Earlier this fall, he sat in the living room of the home he helped build. He didn't bat an eye when he was told that Habitat required hundreds of hours in sweat equity. "Oh, we are ready to work," he recalled saying. "Even (a) thousand hours." Mishra said he had a hand in building 19 of Neighbor Drive's 23 units. Life is hardly simple these days. Mishra works as an airport custodian, which provides the only income for his family of four. He manages his schedule to help care for his wife, who has seizures and can't drive. "Still, I'm surviving," he said. At home, strings of lights line the walls, maps of Alaska hang in the living room, and potted pepper plants grow upstairs. It's a home he's proud of and thankful for, one he trusts can withstand a big quake if the day ever comes. He said it's hard to properly express the gratitude he has for that, having nothing to give but thanks. When Cassandra West put a difficult life in Mankato, Minnesota, behind her in 2005, she landed in a Midtown Anchorage apartment complex with a young daughter. She knew few people and had no job then. Her daughter Alexis, now 16, remembers the Happy Meal toy she played with that first day. In the years that followed, 10 of which she spent in that apartment, Alexis had to grow up a little quicker than most as Cassandra carried the heavy burden of single motherhood. None were more difficult than the few recent years in which Cassandra worked the graveyard shift at Providence Alaska Medical Center. There, she transported patients around the building and racked up overtime to make rent. Alexis stayed home, looking out for her much-younger brother and sister. Mother and daughter crossed paths at about 7 a.m., when Cassandra got home from work and Alexis started toward her school bus stop. Sleep, when it was possible, was brief for Cassandra in those years. For a while she had day-care, but the expense was more than she could afford. Cassandra gave her kids the bedrooms and slept on the couch, in part to keep her daughter from sneaking out at night to see friends. Alexis said that wasn't always enough. She could hop out the bedroom window. Alexis saw her mother struggling and wanted to help. She stayed home alone with her siblings, which was sometimes frightening. When Christmas rolled around, she didn't mind that their tabletop tree was tiny and presents were few, and that they'd have to wait for mom to get home from work in the morning to open them. When Alexis' teen friends boasted that their Permanent Fund dividend checks had arrived, she knew hers would go toward household expenses. "It didn't bother me because it was helping us," she said. Over the years, Cassandra watched the condition of her apartment deteriorate despite their best efforts to keep it clean. When she complained to the landlords that she suspected mold in the carpet, she was told to move out if it bothered her, she said. Through all it, Cassandra was undeterred, even when she was not selected to be a Habitat participant the first time she applied. Instead, she rededicated herself to reducing her debt, managing her finances and trying again. "I was really proud of myself that I tried," she said. When she completed the mandatory hours of sweat-equity in Habitat construction, she kept coming back, wanting a hand in constructing the home that she lives in now. Problems haven't all disappeared since they moved into their four-bedroom condo in the summer of 2015, but Cassandra, now 39, said it seems a little more manageable from her clean and comfortable home. Alexis remembers being excited at first that each family member would have space all his or her own. "We went from… a two bedroom house that was like supersmall to, like, a really nice house with stairs," she said. Cassandra likes those stairs, too. It would mean another deterrent to keep her freckle-faced teen with the broad smile from sneaking out. "She's on the second floor now," Cassandra said with a laugh. "She can't do it." 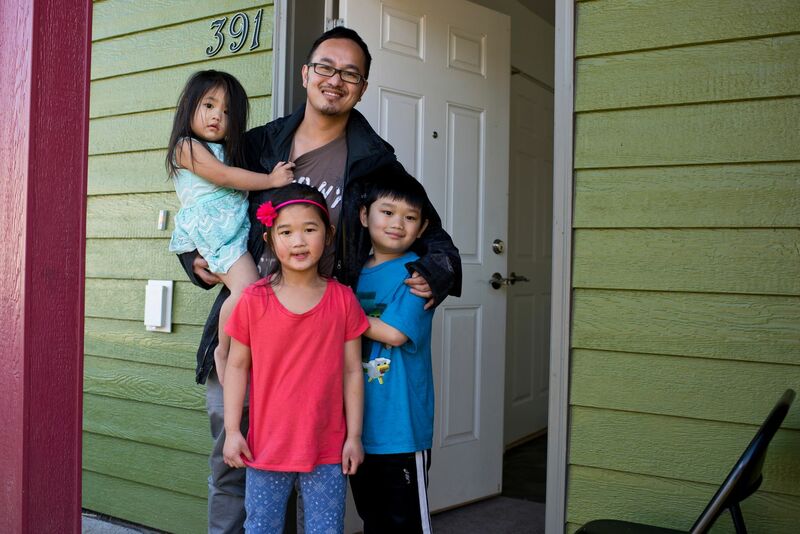 Roger and Eden Manalo's family was the first to move into the Neighbor Drive development. Eden remembers that exciting day: June 21, 2012. There were far fewer townhouses constructed then, and more trees. "It was very quiet," she said. Eden brought a little noise with her. Back at her apartment on Government Hill, she'd often get knocks on the doors from her neighbors downstairs. The sounds of her sons playing disturbed some of the other apartment dwellers. Roger came to Alaska from the Philippines 20 years ago, looking for work opportunities. He spent several years homesick, traveling back home every year to visit. In Anchorage, he worked as much as possible. He spent 18 years assisting guests at the Anchorage Hilton. Eden joined Roger in Anchorage in 2006. As their family grew, it became difficult to stay in their small apartment. She felt so fortunate for the Habitat for Humanity opportunity that it seemed like it must be part of God's plan, she said. Though she didn't drive when it was under construction, she took the bus back and forth to help hammer nails at the construction site. Their home is lively now. In late September, Eden gave her husband a haircut in the kitchen while her sons played on the living room floor. No one lives below them now to complain. The couple doesn't make it back to the Philippines as much as they used to. Plane tickets can be thousands of dollars each. But part of home joined them here. Roger's father and Eden's mother now live with the family in Anchorage. That's not the only way the family is growing. The Manalos are expecting their fourth boy in December. 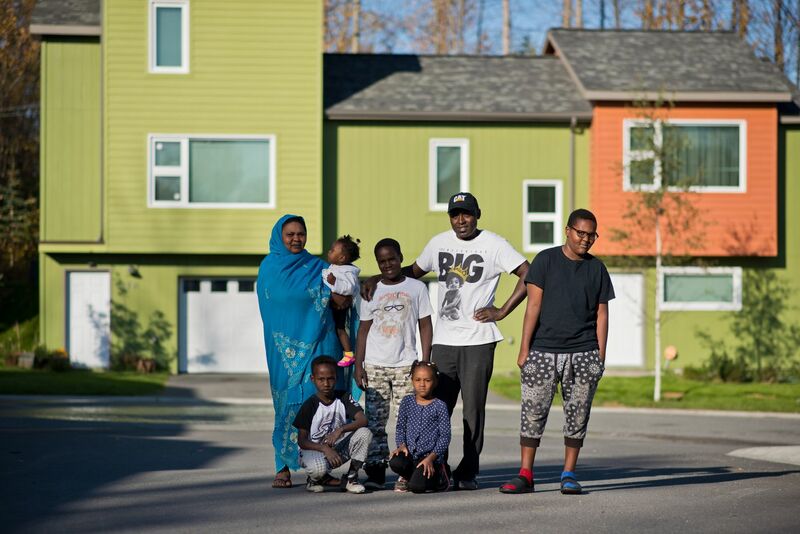 Just 10 days after moving into his Neighbor Drive home with his wife and five kids, Mohamed Bakr stood outside in the sunshine. He worked on several of the homes that surround him and helped paint his own. Bakr was just 15 when he fled violence in Darfur, Sudan, to live in Libya. "I move because my country (was) so difficult," he said. "The government kill many people." In the years after he left Darfur, hundreds of thousands of people were killed in the region, and millions were displaced. Bakr said he lost a brother and a sister. But in Benghazi, Libya, Bakr was able to build a life. He owned a nice home, he said, and a business fixing and selling cars. For 15 years, life was good. But civil war in Libya changed everything in 2011. Sudanese people living there became a target in the fighting, he said. Some of his experiences from this period are too difficult to share. "What I (saw) over there, it's not OK for me," he said. Bakr's cousin, Ibrihim Abdalla, who also lived in Benghazi at the time and also lives in Anchorage now, said his family faced grave danger in 2011. He said the International Red Cross saved their lives by helping them pass checkpoints on the road out of the city that allowed him to escape to Egypt. He spent a year in Sallum, an Egyptian border town that became a gathering point for refugees. On the long, restless journey across the globe toward Alaska, he remembers a police officer in Chicago joked that he'd freeze in the north. In the U.S., Bakr sees a place where people of all colors and backgrounds interact with one another. 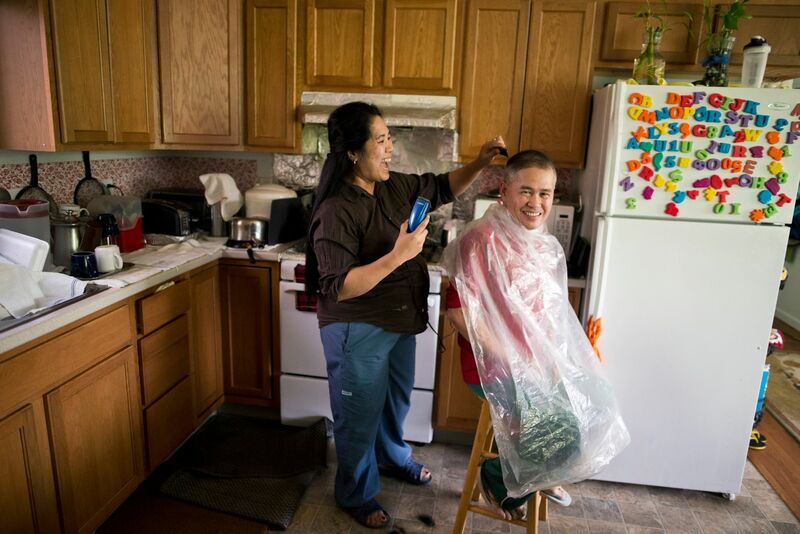 For his work at Alaska Native Medical Center, Bakr gets up at 3 a.m. to get to work by 4. He enjoys the quiet of his new Neighbor Drive home, where his kids don't have to play close to a busy street, like they did at the apartment he moved from. "My family's happy now," he said. It was a hard life in Ethiopia's Pinyodo refugee camp for Sudanese people, but for Rhoda Jal it was hard to leave. Being the oldest child, it was her role to care for her mother as she aged, according to tradition. And supporting her mother meant supporting a woman who was devoted to the orphans of war. "My mom was a wonderful. I'm not going to be the same as my mom," she said. "She was so kind, so giving. She wanted to serve people." Jal's mother, Sarah Chany, cared for 32 orphaned kids at the camp over the years, and their home had a big family atmosphere that included them, she said. One of those young men eventually became Jal's husband. "(He) was taken by 12 years … of age to be a soldier in south Sudan. So, in 1995, he escaped to come into Ethiopia with the refugees," Jal said of Kuach Dak. Their wedding ceremony, held on a soccer field, was large and filled with dancing. A year later, the couple came to the United States. In October, they celebrated their 17th anniversary in a full and active household in the Neighbor Drive subdivision. Jal jokes you can probably hear their voices from out on the road, oftentimes. "Oh my goodness, we are so grateful. So grateful," she said. "I never imagined, my husband and I, we can have a home to make sure our children (have) a safe environment to live." Jal's mother, who had moved to Egypt the years since Jal moved, passed away on July 4 of this year. When Jal returned to Africa, she learned her mother had found ways to use the money Jal had been sending her to help other refugee families. "That little, tiny support I give her to support her, she want(ed) to support more people with it," she said. With the life ahead of her in Alaska, she hopes she can live up to that example. "I'm not quite yet, but I want to be my mom. I want to make a big difference," she said. "I want to continue (in) her fashion and her love … I will try to do that." Yang Lor remembers his kids were nervous on the first night they spent in their new home on Neighbor Drive. This place felt big compared to their apartment in a fourplex in Mountain View, the only home his kids had known. But Lor, 32, isn't looking back. Not only was the apartment far too small for his growing family, but it was in poor condition. The roof leaked and cockroaches scurried. "It's nasty. It was just horrible," he said. Homeownership didn't seem possible until he saw a flier for Habitat for Humanity hanging downtown. Long days followed after he was selected. "You have to put in 500 hours (of labor), and I had to do that after work," said Lor, who works in accounting for Sky Chefs, a food service company to the airline industry. It took a year of tacking a couple extra hours of home-building time on to his normal workday to put in the required labor. Perhaps it's a work ethic not so different from his parents'. Lor, who is Hmong, moved to California from Thailand when he was just 2. Although he has no memories of living overseas, he grew up hearing the stories of his parents' tales of a hard farming life, and a simple home with an earthen floor. "They will tell you their struggle," he said. Standing in the doorway of his new home, with his work badge clipped to his shirt, three of his four kids stood around him while his wife and baby were inside. The sun shined bright on the street that he said is a safer place for his kids to play. Everybody dreams of owning a home, he said. "You always want the best for your kids," he said. Upbeat Spanish pop music filled Jose Bautista's home on a Saturday afternoon as his large family did chores. Even the little ones pick up their rooms and do some light dusting, pitching in to keep the house clean and comfortable. Bautista hopes he has sacrificed enough to ensure his kids – seven at home and two grown – will never have to experience what he did as a child. "Me and my family, we lived poor," Bautista said of growing up in Cojutepeque, El Salvador. "Never had a big house." He was just 7 years old when he began working to support his mother and two siblings, he said. The workday then started at 6 a.m., mixing sand and cement. At noon, he'd catch a quick shower and go to school. At home, he remembers his fingers were often so raw and cut that it was sometimes hard to pick up a tortilla. Life was like that for a few years. Then he left school altogether. "I remember 11 years old, I'm working full time," he said. 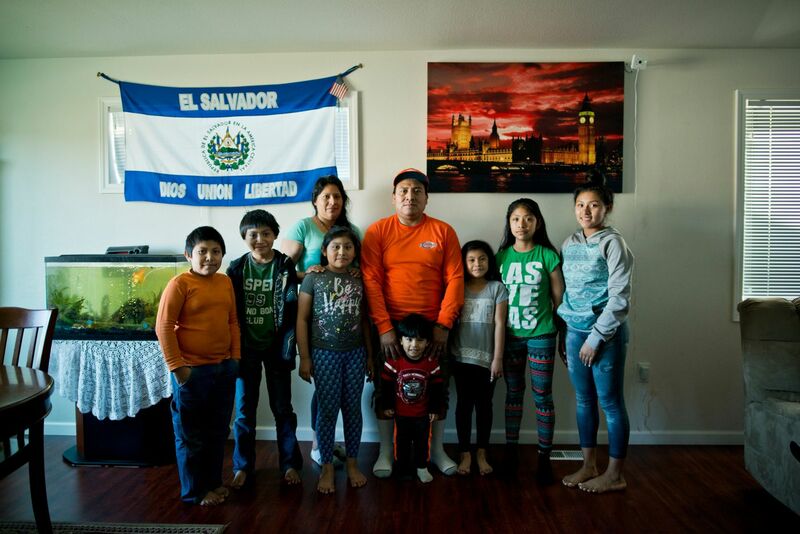 Before he left El Salvador, Jose said he was loading trucks, regularly waking up at 4 a.m. and working until midnight for a wage equivalent to $8. Sundays he worked half a day, his only break of the week. It could've been worse, he said. Other companies paid only $5 for similar work. His difficult path continued after coming to Anchorage in 2006, too. His wife, Maria Sorto, worked cleaning houses, and Jose walked from his Jewel Lake-area apartment to his job at Carrs Safeway in Midtown. When his wife eventually stayed home with their kids, Jose worked two jobs to make ends meet. By the time they filled out an application with Habitat for Humanity, the ceiling was leaking in their apartment. Once, a chunk of it fell in the living room while one of his sons played on the floor nearby. When a fire tore through the family's Spenard apartment building in January 2014, they lost everything, he said. So, when they were selected to become Habitat homeowners, Jose thought it seemed hard to believe. "I said (to) my wife, 'Maybe it's not true'." These days, Jose cleans buildings on Joint Base Elmendorf-Richardson. On weekends, the family gathers for big meals, sometimes making papusas, tortillas stuffed with beans and cheese. It's the happiest time of the week, he said. He and his wife are expecting their 10th child in April. Next year, Jose plans to return to El Salvador to visit. It will be the first time he's seen his mother since he left 12 years ago.